Show Dad You Love Him with our ALL YOU CAN EAT Feast Fit for a King! Magdaleno's is serving up a meat lovers paradise from tender slow Roasted Sirloin, succulent Grilled Shrimp, & savory Pork Chops. *Regular, bar, and patio seating available for reservations. Patio seating will be available weather permitting. Have Questions? It would be our pleasure to help, call us at (734) 283-8200. 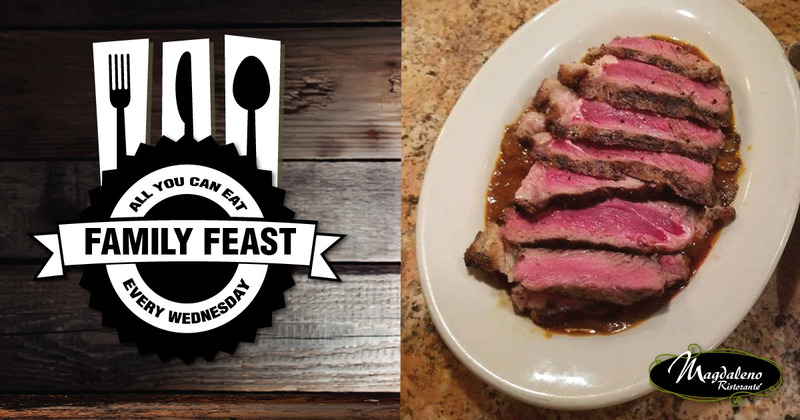 Each Wednesday we feature an all you can eat family feast with a rotating menu. 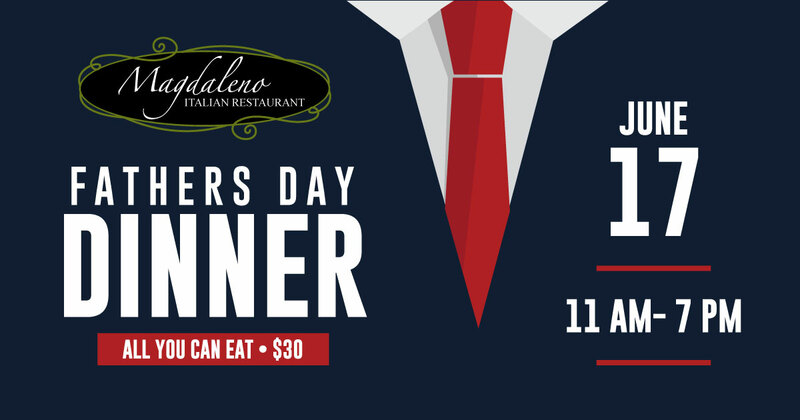 Feast on delicious appetizers, entrees, and dessert and bring the family! Our rotating menu has something for everyone. Reservations are strongly recommended. Tables fill up quickly. Tucked away just off the main drag of Biddle Avenue lies a veritable treasure trove of unique, fresh Italian food — better known as Magdaleno Ristorante. Headed by chef Ernesto Magdaleno Guzman, who, at 36, has been a chef for half his life. Magdaleno Guzman's passion for melding unique flavors and making fresh pasta, bread and more is directly reflected in his restaurant's menu. In fact the restaurant puts out three to four special entrees daily and is constantly updating its menu to reflect seasonality and creativity. Traditional items are not neglected, however. Those looking for Sicilian and Italian classics like lasagna, veal picatta and ravioli can find it at Magdaleno, and nearly every pasta is made in house, including the ravioli. Those with diet restrictions are not neglected, either, as there are gluten-free, vegetarian and vegan options. Food is all incredibly fresh as Magdaleno Guzman shops daily to hand select ingredients, and he refuses to allow a microwave in his kitchen.